1. Place the pork mince into a large bowl, then add onion, breadcrumbs and oregano. Season and mix together. 2. Divide the mixture into 4 and shape into burgers. 3. Heat the olive oil in a large non-stick frying pan and cook the burgers for 5-8 minutes on each side or until cooked through. 4. 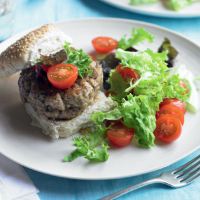 Serve in the buns with a side salad and a few cherry tomatoes.